If you've ever been to a supermarket in the UK, you were probably surprised (if not a little grossed out) to see stacks of eggs hanging out with nary a refrigerated one in site. As it turns out, we might actually be the crazy ones. 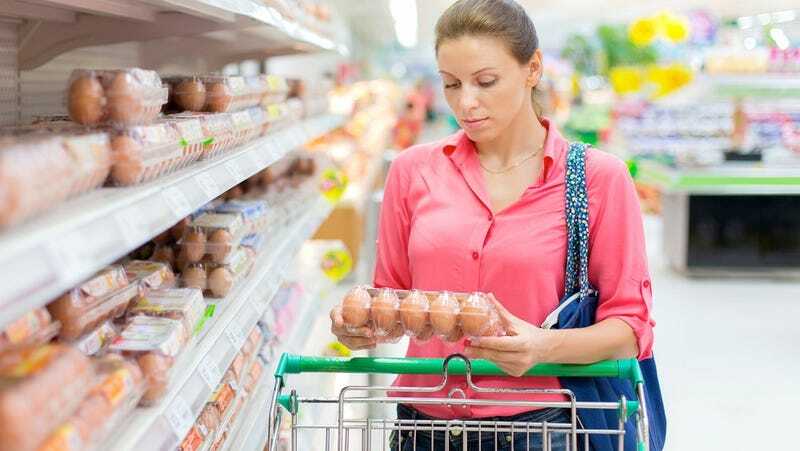 In the U.S., the Department of Agriculture (USDA) requires that eggs destined to be sold on supermarket shelves — called graded eggs — are washed and sprayed with a chemical sanitizer before they are sold to the public to reduce the risk of salmonella infection. In the U.K., Grade A hen eggs may not be washed because the process is thought to "aid the transfer of harmful bacteria like salmonella from the outside to the inside of the egg," according to the Food Safety Authority of Ireland. In fact, Forbes contributor Nadia Arumugam pointed out that USDA graded eggs could not be legally sold in the U.K. (and the other way around) due to these different preparation methods. So what does all that have to do with refrigeration? Since the US generally uses factory farm environments to raise our chickens, our eggs are far more susceptible to salmonella contamination. Which means that washing the eggs is absolutely imperative. In the UK, though, farmers prioritize producing "clean eggs at the point of collection, rather than trying to clean them afterwards."